All-hay and alfalfa December hay price averages held steady in USDA’s most recent Agricultural Prices report. The all-hay price dropped to $136 per ton, down $2 from the previous month but $13 per ton higher than December 2016. 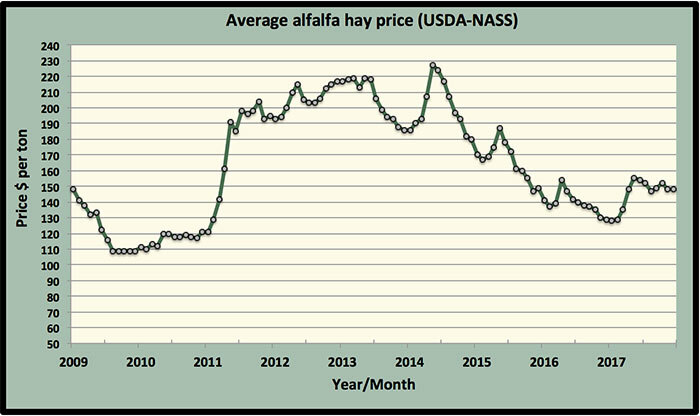 Hay other than alfalfa held steady at $118 per ton for the third consecutive month, which was $1 per ton above December 2016. The December alfalfa hay price kept pace with November at $148 per ton; that’s still $21 per ton higher than December 2016. In January 2017, alfalfa hay started the year at $128 per ton, $20 per ton less than where it finished. Based on data from the Hoyt Report, Supreme and Premium quality hay prices are running $30 to $40 per ton higher than January 2017 in Central California, but that’s not the case everywhere and sales are slow. It will be interesting to see where prices go from here. Last year’s lowest price was recorded in January. The highest price was in May at $155 per ton. The predicted soft milk prices during the first half of 2018 won’t be a benefit in dairy hay markets. Very few states experienced alfalfa price gains for December. Michigan was the only state with a significant bump at $20 per ton. Price losers were more numerous. Iowa (minus $16), North Dakota (minus $14), Minnesota (minus $13), and Wisconsin (minus $11) led the group with price declines. The highest alfalfa hay prices are being reported from New York ($235 per ton), Kentucky ($205 per ton), Pennsylvania ($190 per ton), and California ($185 per ton). 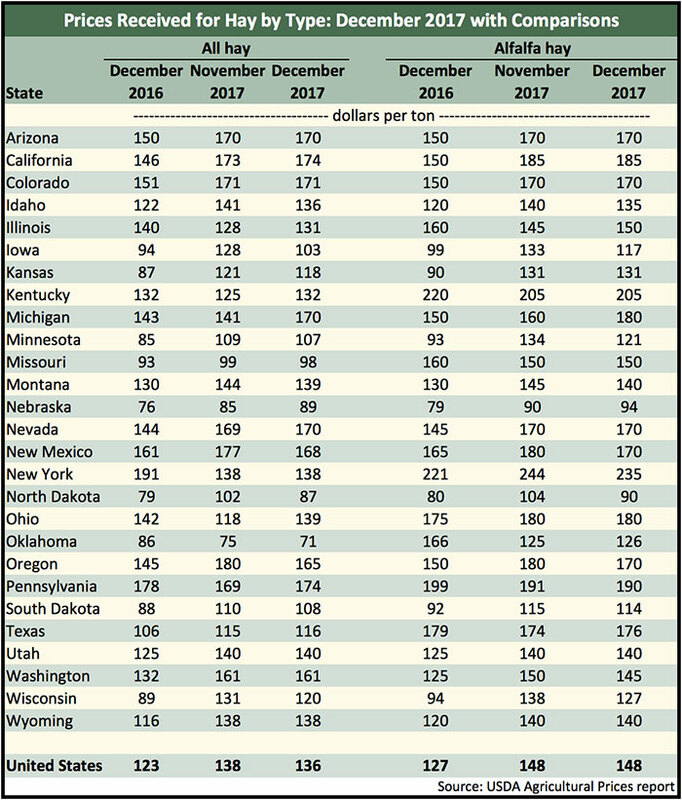 The lowest prices can be found in North Dakota ($90 per ton), Nebraska ($94 per ton), and South Dakota ($114 per ton).